Sempervivum (also known as Hens and Chicks) are one of the most common types of succulents. The mother (hen) plant grows an underground stem that produces a new (chick) plant. Chicks can be as small as one inch across, while mothers are much larger at 8-12" across. Sempervivum make great container plants, and they can be used in dish gardens and fairy gardens. They prefer to be at room temperature (72 F), which makes them a perfect houseplant. Hens and Chicks do not require much care: as the plants produce flowers, the flowers simply need to be removed as they die, and mothers and chicks will need to be separated to prevent over-crowding. 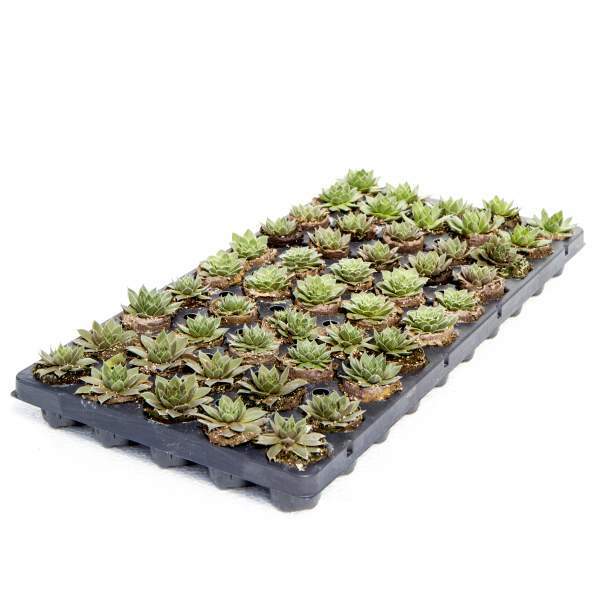 Our high-quality 50-cell plug trays come ready to transplant into your final container. Succulents are not prone to many diseases but don't oversaturate the soil. If the plant sits in moist soil for an extended amount of time, you could end up with root rot, stem rot or botrytis. Botrytis grey rot is usually associated with wet or humid conditions. You can prevent botrytis by allowing the plant to dry out between waterings, allowing for good airflow in your greenhouse, and spacing to allow the sun to penetrate to the soil level. The most common chemicals used to treat botrytis and root rot are Medallion and Banrot. Use them as a drench according to each label's instructions.